Playground bullies have been placed on notice – kids as young as five are learning to stand up for themselves and their friends. Children’s therapists in Sydney’s northern beaches explain how to deal with bullying. One every four Australian school students is affected by bullying, says recent research commissioned by the Federal Government. According to Educational and Developmental Psychologist, Robyn Fallshaw, schools now have anti bullying policies that empower children and help them to overcome playground politics. Ms Fallshaw said that bullies deliberately set out to hurt, embarrass or feel superior to their victim. “Bullying is about power,” she said. She said that bullied primary schoolers are usually singled out because of perceived differences from their peers. “Kids who wear glasses, don’t like sports or are big for their age have traditionally been a target for bullying,” she said. Sonja Walker, a teacher, said that children can learn to stand up for themselves. “For some kids, it a matter of becoming confident enough to look their assailant in the eyes and giving as good as they get,” she said. “Bullies find it hard to be menacing when the tables are turned and the audience they are trying to impress is laughing at them,” she said. Robyn Fallshaw advised that changes to a child’s behaviour at home can indicate that they are being bullied at school. “Classic symptoms of bullying include a reluctance to go to school or an apparent absence of friends,” she said. Robyn and Sonja agreed that concerned parents should always consult their child’s teacher if they suspect that their child is being bullied. “Schools take bullying very seriously and if parents identify their concerns clearly, teachers and principals are likely to take immediate action to address the problem,” Brenna Donovan said. 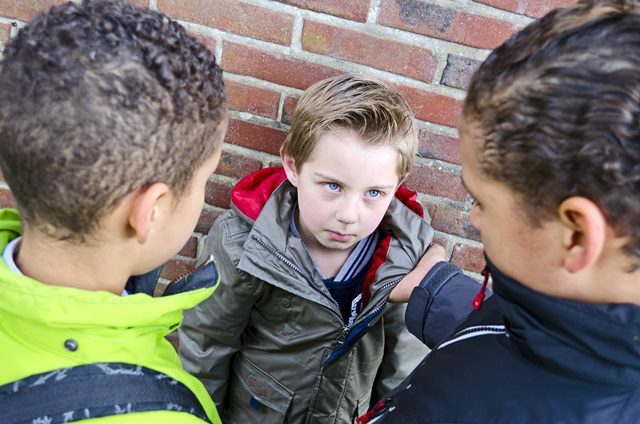 Robyn Fallshaw said that there are many ways in which parents can help their child to build the emotional resilience needed to make bullies back off. “Helping a bullied child to build peer relationships is very important,” she said. She also advised parents to befriend other parents at school. Need help for your bullied child? If your child is being bullied, you don’t have to deal with it alone. Kids First’s child psychologists have supported hundreds of children and families just like yours and we are here to help. We provide friendly, professional…and most importantly, practical advice and strategies that could provide solutions to the bullying problems your child is facing. Sometimes, just talking to someone who is not part of your child’s school is a great way to get clarity and ideas that can make things better. Call us today on (02) 9938 5419 to find out how one of Kids First’s Child Psychologists can give you the support you need right now.